Archcore steel agricultural buildings have quickly replaced the old wood frame metal barns of years past. Our agricultural metal buildings are designed to economically protect all your farm equipment and offer a fast easy assembly. Since they are totally pre-fabricated and manufactured with Galvalume steel, Archcore buildings can be built much quicker and last much longer than the older wood and tin structures. They are remarkably easy to construct, and provide maintenance free use for a lifetime. Our 100% clear span building allows complete use of the interior because there are no interior beams, posts, or trusses. This means you can use the building for hay storage and stack round and square bales as high as possible without interference. The high profile "A" Models and the straight sided models can have workbenches or racks right against the walls and accommodate the largest equipment. Because of their strength, agricultural commodities can easily be stored right up against the walls without special linings or braces. 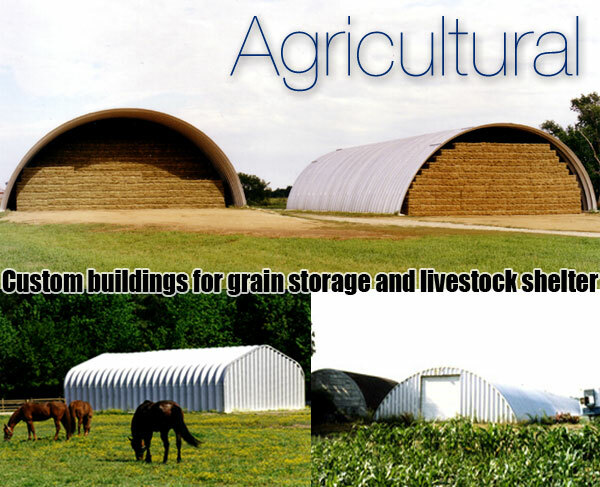 These agricultural metal arch buildings are ideal for corn, grain or crop storage, livestock steel barns or farm equipment sheds. Ranging from 10' to 120' wide with unlimited lengths, our pre-fab agricultural barns are extremely flexible in design. We offer a variety of different models, each with their own benefits that can meet virtually any farm building application. Archcore delivers directly to the consumer, the highest quality all steel buildings in the country at the most affordable prices. With our metal farm building kits, you receive the most attractive, maintenance free building on the market, with the longest warranty and best customer service to match! !